Social media marketing campaigns should be common place within your overall social media marketing strategy. A campaign is something outside of your normal efforts and strategy that is specific to an event, launch or other unique marketing goal. Incorporating social media campaigns into your social media marketing efforts are an exceptional way to leverage your existing strategy and community for a clearly defined short-term objective, while maintaining your existing strategy and community expectations. There were several steps and planning involved in our social media drip marketing campaign that began months ahead of time. Meaning we had already done the work to build a community by delivering value in our streams and the effort to establish and maintain relationships with that community. Had we not first done this, nothing else in the campaign would have achieved such incredible results. Before you plan a campaign, ensure that you have invested the time and effort with your followers and friends. Nothing is more crucial in your social media marketing efforts before you embark on additional campaigns. As with any effective marketing, time spent planning and preparing will be in direct proportion to the results you obtain. Below we will outline exactly what we did to plan, create and execute our 2.0 launch campaign using Bundle Post and how you can do the same. Step 1: Clearly Define Campaign – Be sure you have defined your objective and the length of the campaign very clearly. Know exactly when you the campaign is to start and end, as well as the goal you are trying to achieve. It is incredibly important that the goals and objectives you set for a campaign is realistic. Not doing so will surely make the campaign unsuccessful and more importantly jeopardize your decisions when creating your campaign based on such false hopes. Objective – Create buzz and awareness of the Bundle Post software for those who had not heard about it, and let those that have heard about it know that a big new release was coming. Goal – Increase active user base by 30% during the launch campaign. Campaign Timeline – 2 weeks (exactly 13 days) prior to the scheduled launch date. Step 2: Create A List of Supporters – You will want to create a list of people, brands and contacts that are your supporters that will, (without question) be willing to help you with your campaign. You must be sure that you ONLY ask your real friends and supporters to be involved. Don’t include big name social media people, large brands and celebrities that you WISH would be a supporter and help with your campaign, just include customers and relationships you know will be willing to help. *More on supporters in steps 3 and 7. Step 3: Create Schedules – This step is the most complicated, so take it slow and make sure you cover all angles. First, determine the number of posts per day you want to send for all of your related social media accounts and networks. Do not forget your personal accounts if you are a brand. Within Bundle Post Schedules, you will want to make a new schedule for each of the social media accounts that will be involved in the campaign. If there are multiple social media accounts on the same network that have the same number of posts per day (Twitter in our example) make separate schedules for each with the time slots different for each. This way they will not be posting at the same time on the same network, though they will be posting 4 times each day during the campaign. *you can also use the Bundle Post drip campaign for FB pages, Facebook personal profiles, Linkedin and G+ pages and any other groups or social networks supported by Hootsuite. Number of Posts: Before you begin writing the social media posts for your campaign, you first need to determine how many posts you need for the entire campaign. To calculate this, take the highest number of posts per day in any of the schedules you have made for your campaign (in our example it is 4 posts per day for Twitter) and multiply it by the number of days for the campaign. In our example, we did a 13 day campaign. Writing Posts: So now you will want to create a new “My Content” folder in Bundle Post and begin writing the text of your 52 posts and include a URL where appropriate for each post. It is really important that these 52 posts have no duplicates for two reasons; 1) Bundle Post will not allow you to have duplicate posts included in an export (due to Hootsuite’s restriction) and 2) You want all of your posts to be different so they are not intrusive in your streams. Using a small number of URLs mixed across the 52 posts is fine though. The All new @BundlePost 2.0 will be launching June 13th!! *Notice that some posts had URLs and some did not. You’ll want to mix it up depending on your specific campaign requirements, product or service. Step 5: Create Facebook Graphics – We added some creativity to our campaign by creating graphics about the launch that counted down the days like a space shuttle launch. We manually uploaded and scheduled them on our Facebook page and as they posted live each day, we would manually share links to the graphics on all the other social networks. We highly suggest this for many cases. It not only provides the visual aspect for your messaging, it helps drive traffic and likes on the fanpage, making the graphics you post on the Facebook page linkable from other networks. Click Export in Bundle Post. On the Export Table, scroll down to My Content folders and open the “Campaign” folder with your 52 posts in it. Select all the posts for the export, run hashtags if desired, then export. Upload the Bundle Post file into Hootsuite, selecting the proper social media account that coincides with the schedule you just used. If you have multiple accounts on the same social network (as in our case on Twitter) not only did we use different posting times for each, we also used the Auto Sort function on the Export Table to ensure that the same posts were not posted to the same network by these three Twitter accounts at or near the same time slots. To do the exports for the other social networks, you will also calculate the number of posts you need for them based on the number of posts per day. For Example: In our campaign we posted 4x’s per day on Twitter and only 2x’s per day on Linkedin. Therefore we exported 52 posts for the Twitter campaign from the My Content folder and only 26 posts for the Linkedin schedule export. – *If we exported all 52 posts for the Linkedin schedule, the campaign would run for 26 days on Linkedin, due to the fewer posts per day in the Bundle Post schedule made for our Linkedin account. Make sense? Step 7: Do Exports For Supporters – Lastly we used a little known ability of Bundle Post to expand the reach and success of our campaign. We created additional schedules and exports for that list of friends and supports and gave them Bundle Post files to upload into their Hootsuite accounts! Therefore we had some 20 other Twitter accounts also sharing our campaign posts at different times and all they had to do was upload our file. Easy and effective. So there you have it. 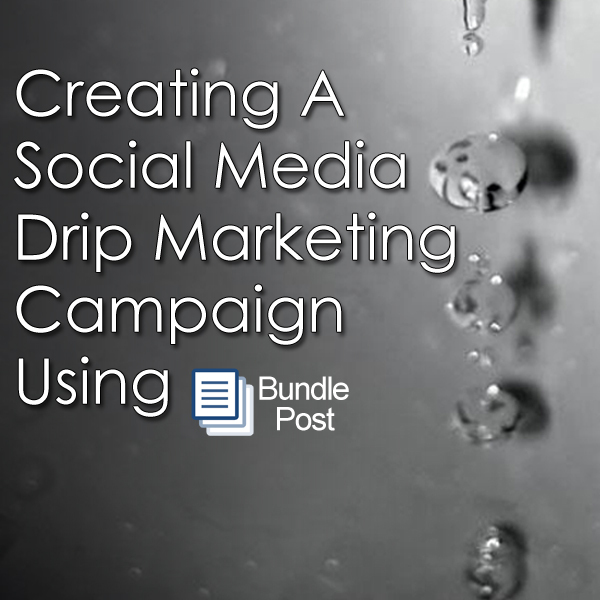 All the details of how we launched 2.0 using the Bundle Post system to create an effective social media drip campaign. The result of the campaign not only achieved our objectives, it exceeded our goal by a huge percentage. We increased our active user base by 100% instead of the 30% goal and have continued the growth with a smaller, ongoing drip campaign using Bundle Post that continues to drive traffic and new user growth. Robert, this was pure genius in my humble opinion in how you worked with your supporters to help you spread the word. Thank you for documenting this for all to see. I will be forwarding this off to many. You are too kind buddy. Thanx for the support! 1: How do you determine an overall quantity/saturation level for your campaign? 2: How do you weigh your post numbers per platform, specifically, how did you weigh your Fanpage vs your personal page? Another one hit out of the park sir. Thanks. 1) No real straight forward answer on that one. It’s knowing your market, audience and have put the work in to earn the right to sell a bit in your stream. It also has to do with knowing the scheduled and live posting volumes you are already conducting and how those fair with the audience. 2) We don’t weigh individual platforms, but the overall combined results. Our SM program is used as a single component in our marketing, not as separate platforms. Measuring is pretty easy via a combination of Hootsuite and site analytics combined with new user registration.